Do you use any of the online book-cataloguing sites, like Library Thing or Shelfari? Why or why not? Yes and Yes; I keep a commonplace book, a database and a GoodReads. 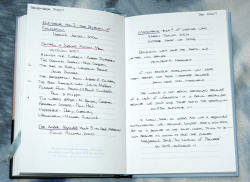 My favorite "catalog" is my commonplace book. All the books and magazines I've read get listed in the book. And any interesting quotes. It's a delight to page through. 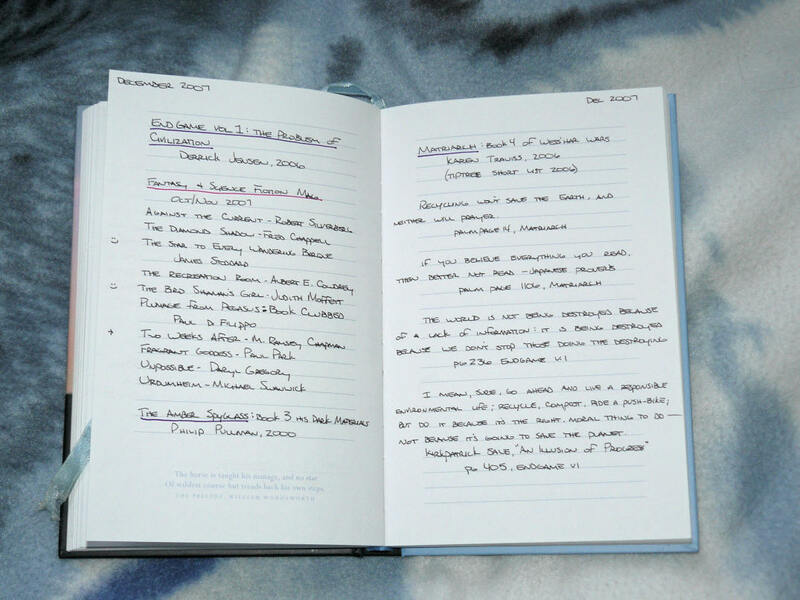 I use hard backed, lined journals for my commonplace books. Currently I'm about half way through my second one. The first one is years 2001 through 2004, and the current starts at 2005. The database that I use is most convenient, and I use it when I need an author's name or random book info. It's called BookBag, it's software for my handheld and it also keeps the list on my computer as well. I've got 367 books listed right now. But that's only the books I've read since year 2000. I've not entered the books I bought before then, and there are hundreds, so unless I re-read them, they probably won't make it into the database! As for online catalogs, I did join LibraryThing last year. I added a few of my Animal Fiction books and then lost interest. Here's my, um, 18 books there: rift's LibraryThing. And more recently, I joined GoodReads. I've entered 18 books there, too, and written reviews for some of them. They have a "Vegan" group there... of which I was the second member and now they've got all of four! haha. Here's my profile: riftVegan at GoodReads.